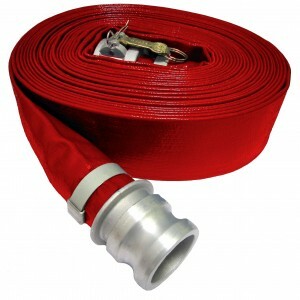 Type 7801R HD-PVC Red Discharge Hose is a pump discharge hose designed with a heavier wall for higher working pressure rating and improved durability in rough applications. Similar in construction to our 7801 pump discharge hose but thicker, this hose is rated at 150 PSI through 6 inch (115 PSI for 8 inch size) for open flow applications. Commonly used in pump rental, dewatering/ remediation, and hydrant access and agriculture. A co-extruded, thick hose-wall design allows for longer lifespan in pump rental and frequent or heavy use. A 3-ply textile reinforcement is embedded within the hose-wall. PVC discharge hose rolls up flat for convenient storage. Available up to 300 foot continuous bales, cut lengths and assemblies. -Made in USA (most sizes). 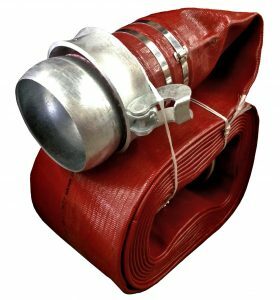 7801R hose is MSHA approved in 1.5 and 2.5 inch diameter sizes.